NETWORK UPDATE: SUPER BOWL 50 adjusted to 37.7 in final numbers, a gigantic number but not the equal of last year’s 39.1. LATE SHOW WITH STEPHEN COLBERT ended up at 7.7 for a show that began at 10:54PM ET and ended at 12:02AM. 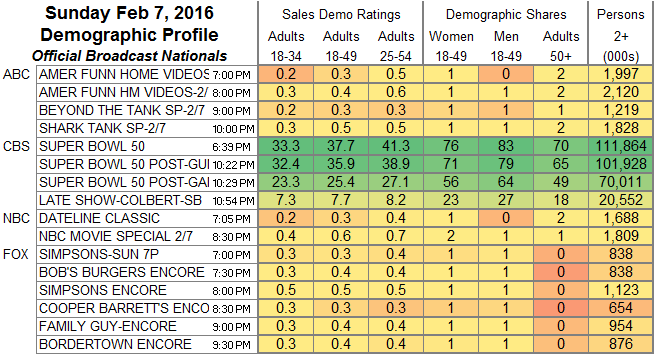 That compared to last year’s 8.4 for the post-Super Bowl episode of THE BLACKLIST. CABLE HIGHLIGHTS: As usual, few networks had any desire to do battle with the Super Bowl, and most of the Top 10 were ESPN and NFL Network programming related to the game. Animal Planet had its yearly moment in the sun with the PUPPY BOWL, down 0.09 from last year’s installment to 0.71, and with a PRE-SHOW at 0.30. 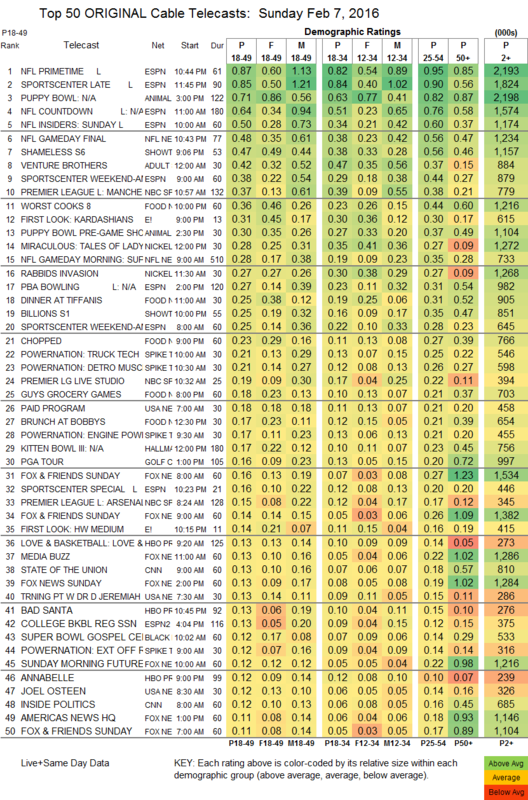 (Hallmark’s afternoon KITTEN BOWL was at 0.17.) Showtime was the most prominent network to air regular episodes of its shows, the result being a SHAMELESS down 0.21 from last week to 0.47, a BILLIONS down 0.12 to 0.25, and THE CIRCUS down by half to 0.03/85K. Adult Swim’s VENTURE BROTHERS fell 0.14 to 0.42. A morning PREMIER LEAGUE soccer match on NBC SportsNet was at 0.37. On Food Network, WORST COOKS dropped 0.18 to 0.36, with lead-in CHOPPED at 0.23, and GUY’S GROCERY GAMES down 0.27 to 0.18.